For other uses of "Suzdal", see Suzdal (disambiguation). Suzdal (Russian: Суздаль, IPA: [ˈsuzdəlʲ]) is a town and the administrative center of Suzdalsky District in Vladimir Oblast, Russia, located on the Kamenka River, 26 kilometers (16 mi) north of the city of Vladimir, the administrative center of the oblast. As of the 2010 Census, its population was 10,535. Suzdal is one of the oldest Russian towns. In the 12th century it became the capital of the principality, with Moscow being merely one of its subordinate settlements. Nowadays Suzdal is the smallest of the Russian Golden Ring towns with population of around 10,000, but is a major tourist attraction. Several of its monuments are listed as UNESCO World Heritage Sites. The town's history dates back to 1024 and in 1125 Yury Dolgoruky made Suzdal the capital of the Rostov-Suzdal principality. Suzdal began to function as a capital at the time when Moscow was still a cluster of cowsheds. In 1157 Andrei Bogolyubsky moved the capital from Suzdal to Vladimir, from which time the principality was known as Vladimir-Suzdal. Set in a fertile wheat-growing area, Suzdal remained a trade centre even after Mongol-led invasions. Eventually, it united with Nizhny Novgorod until both were annexed by Moscow in 1392. After a decline in political importance, the town rose in prominence as a religious center with incredible development projects funded by Vasily III and Ivan the Terrible in the 16th century. In the late 17th and 18th centuries, wealthy merchants paid for 30 charming churches, which still adorn the town. Thus Suzdal reached remarkable ratio of churches to citizens: at one point, forty churches for four hundred families. In 1864, local merchants failed to coerce the government into building the Trans-Siberian Railway through their town. Instead it went through Vladimir, 35 km (22 mi) away. As a result, Suzdal was bypassed not only by trains, but by the 20th century altogether. Furthermore, in 1967 Suzdal earned a federally protected status, which officially limited the development in the area. That is why the place remains largely the same as ages ago – its cute wooden cottages mingling with golden cupolas that reflect in the river Kamenka, which meanders sleepily through gentle hills and flower-filled meadows. Today, the town operates as an important tourist center, featuring many fine examples of old Russian architecture—most of them churches and monasteries. Although having just under ten thousand residents, Suzdal still retains a rural look with streams and meadows everywhere and chicken and livestock a common sight on the streets, some of which remain unpaved. This juxtaposition of stunning medieval architecture with its pastoral setting lends Suzdal a picturesque charm, and in the summer, artists and easels are a common sight. Within the framework of administrative divisions, Suzdal serves as the administrative center of Suzdalsky District, to which it is directly subordinated. As a municipal division, the town of Suzdal is incorporated within Suzdalsky Municipal District as Suzdal Urban Settlement. The only industry in the town is tourism. Suzdal avoided the industrialisation of the Soviet times and was able to preserve a great number of stunning examples of the Russian architecture of the 13th-19th century. There are 305 monuments and listed buildings in Suzdal, including 30 churches, 14 bell towers and 5 monasteries and convents. 79 of them are federally protected buildings and 167 are regionally protected. In 1992 two of the monuments (Saviour Monastery of St Euthymius and Kremlin with Nativity of the Virgin Cathedral) were included in the UNESCO World Heritage List, together with six other White Monuments in this region. The Kremlin is the oldest part of Suzdal, dating from the 10th century. It is a predecessor of the Moscow Kremlin. In the 12th century it was the base of prince Yury Dolgoruky, who ruled the vast northeastern part of Kyivan Rus and, among many other things, founded an outpost, which is now Moscow. A posad (settlement) to the east became home to the secular population - shopkeepers and craftsmen, while the Kremlin (fortress) proper was the home of the prince, the archbishop, and the high clergy. Within the Kremlin, the Archbishop’s Chambers houses the Suzdal History Exhibition, which includes a visit to the 18th-century Cross Hall, which was used for receptions. More exhibits are provided in the 1635 kremlin bell tower (Звонница) in the yard. The 1.4-kilometre-long (0.9 mi) earth rampart of Kremlin encloses a number of houses and churches, including the Nativity of the Virgin Cathedral. This cathedral, with its blue domes spangled with gold, was constructed in 1222-1225 by Yury II on the site of an earlier church built around 1102 by Vladimir Monomakh. It was built of light tufa with limestones for details. In 1445 the cathedral collapsed and was rebuilt in 1528-1530 with the upper structure and drums being constructed of new brick. The original 13th-century door from the cathedral is now on exhibition in the Archbishop’s Chambers. Saviour Monastery of St Euthymius was founded in 1352 to the north of the town centre on the high bank of the Kamenka river. It was built under the order of the Suzdal-Nizhniy Novgorod prince Konstantin. The monastery was planned as a fortress and was originally enclosed by a wooden wall, later destroyed by the Poles. Today's reddish brick walls of the Suzdal monastery were erected over four years, from 1640 to 1644. The solid fortifications have 12 towers constructed according to the artillery power which appeared at that time. When the value of the monastery as a fortress was lost, a new application was found - it became a prison. Prisoners were most brutally punished there, and the place fell into disrepute. In 1905 the prison was abolished. Wooden Church of St. Nicholas. This church was built in Glotovo in 1766 and was moved to Suzdal in 1960 to be part of a Museum of Wooden Architecture & Peasant Life. The church is elevated off the ground about a story high from when it was moved across the country. This church is made out of all wood and represents the close relationship between wood and stone architecture and how precise the Russians were while building this back in 1766. St John the Baptist Church. This church was built in 1720, at the same time that the St. Nicholas church was built, although the difference between the types of architecture of the two churches is quite remarkable. Whereas the St. Nicholas Church is all wooden, the St. John Church is made out of white plastered walls with wooden supports. The St Alexander Convent. This church was built in 1240 by an unknown architect. It is said that the princesses of Suzdal, Mariya and Agrippina, were buried here in the 14th century. Intercession Convent. The convent was founded in 1364. In its center stands the cathedral of the Intercession; it was an add-on built in 1518 financed by Moscow knaz (king) Basil The Third. The interior of the cathedral has no paintings or stained glass, it is simply plain white stone walls all around. The church was and still is one of the richest convents in Russia. The convent is the home of many nuns and is also the burial vault for twenty nuns of noble birth. Connected to the white stoned wall cathedral is an art museum which can be toured. There are many paintings but none in the cathedral itself. This building is filled with arches and art created in the 16th and 17th century. 3. Nativity of the Virgin Cathedral Богородице-Рождественский собор 1222-1225. 4. Assumption Church Успенская церковь 1719. 15. Deposition Cathedral Ризоположенский монастырь 1207. Open Russian Festival of Animated Film is held in Suzdal in March annually since 2002, with the support of the Russian Ministry of Culture. Cucumber Day Festival with folk music performances is celebrated by locals on the second Saturday of July, every year since 2001. There are also 50 guest-houses with a total number of 700 more rooms. Thus Suzdal has developed an outstanding ratio of about 20 hotel rooms per 100 population (comparing to 0.2 rooms for Russia in general, or 1.6 rooms for USA). Suzdal has 13 restaurants (with 1429 seats), 10 cafes (305 seats), 11 bars and 73 souvenir shops. In 1982 Suzdal became the first Russian town to receive "La Pomme d'Or" ("The Golden Apple") - a prize for excellence in the tourism industry, awarded annually by the World Federation of Travel Journalists and Writers (FIJET). According to local historian Yury Belov, in summer 1964 three different feature films (Metel, Zhenitba Balzaminova and Tsarskaya nevesta) were filmed in Suzdal at the same time. Church of Boris & Gleb - church in a nearby Kideksha village, UNESCO World Heritage Site, 4 km (2.5 mi) away. ^ a b c d e f g h "Устав муниципального образования город Суздаль Владимирской области" [Charter of the Town of Suzdal of Vladimir Region] (PDF). Official website of Suzdal (in Russian). Retrieved January 16, 2016. ^ a b c d e f "Характеристика города Суздаль" [Characteristic of the Town of Suzdal]. Official website of Suzdal (in Russian). Retrieved January 16, 2016. ^ a b "Глава города Суздаля" [Head of the Town of Suzdal]. Official website of Suzdal (in Russian). Retrieved September 20, 2016. ^ a b c d e f Ragozin, Leonid (March 2015). "Suzdal". In Richmond, Simon (ed.). Russia (7 ed.). Lonely Planet. ISBN 978-1-74220-733-9. ^ "Праздники в городе Суздаль" [Holidays in the Town of Suzdal]. Information portal "Town Day" (in Russian). Retrieved January 16, 2016. ^ "Численность населения Российской Федерации по муниципальным образованиям на 1 января 2015 года" [Population of the Russian Federation in 2015] (rar). Official website of the Russian Federal State Statistics Service (in Russian). ^ a b "White Monuments of Vladimir and Suzdal". UNESCO/World Heritage Convention. ^ a b "World Heritage List No.633 Vladimir/Suzdal. ICOMOS Evaluation" (PDF). UNESCO/World Heritage Convention. October 1992. ^ a b c d Vorhees, Mara (2006). "Suzdal". In Richmond, Simon (ed.). Russia & Belarus (4 ed.). Lonely Planet. ISBN 1-74104-291-7. ^ Luxmoore, Matthew (July 1, 2012). "Suzdal". The Moscow Times. Retrieved January 18, 2016. ^ Государственный комитет Российской Федерации по статистике. Комитет Российской Федерации по стандартизации, метрологии и сертификации. №ОК 019-95 1 января 1997 г. «Общероссийский классификатор объектов административно-территориального деления. Код 17 254», в ред. изменения №278/2015 от 1 января 2016 г.. (State Statistics Committee of the Russian Federation. Committee of the Russian Federation on Standardization, Metrology, and Certification. #OK 019-95 January 1, 1997 Russian Classification of Objects of Administrative Division (OKATO). Code 17 254, as amended by the Amendment #278/2015 of January 1, 2016. ). ^ Brumfield, William Craft (1997). Landmarks of Russian Architect: A Photographic Survey. Routledge. p. 60. ISBN 9056995367. Retrieved April 4, 2016. ^ "Официальный веб-сайт Открытого Российского фестиваля анимационного кино" [Official website of Open Russian Festival of Animated Film] (in Russian). ^ "'Cucumber Day' Celebrated in Russia". NBC News. July 16, 2015. Retrieved January 15, 2016. ^ "The Travel & Tourism Competitiveness Report 2013" (PDF). 2013 World Economic Forum. p. 424. Retrieved April 4, 2016. ^ "Golden Apple Award". Official website of the World Federation of Travel Journalists and Writers. ^ a b Belov, Yury (2006). В главной роли Суздаль [Starring Suzdal] (in Russian). Algoritm. ISBN 5-9265-0281-0. ^ "Соглашение между городами Ротенбург об дер Таубер (ФРГ) и Суздаль (СССР)" [Agreement between Rothenburg ob der Tauber (FRG) and Suzdal (USSR)] (PDF). Official website of Suzdal (in Russian). April 24, 1988. ^ "Соглашение между городами Клез (Италия) и Суздаль (Россия)" [Agreement between Cles (Italy) and Suzdal (Russia)] (PDF). Official website of Suzdal (in Russian). October 1991. ^ "Oberlin's Connections Around the World". Oberlin: Yesterday, Today, Tomorrow. USA. ^ "Sister City - Suzdal, Russia". Official website of Windham, NH. USA. ^ "Соглашение о дружбе и сотрудничестве между г.Суздалем (Россия) и г.Эвора (Португалия)" [Partnership agreement between Suzdal (Russia) and Évora (Portugal)] (PDF). Official website of Suzdal (in Russian). August 12, 2006. ^ "Protocole d'accord de cooperation entre les municipalités de Souzdal et Loches" [Partnership agreement between Suzdal (Russia) and Loches (France)] (PDF). Official website of Suzdal (in French). December 15, 2011. ^ "Соглашение о сотрудничестве между администрациями города Суздаля (РФ) и города Шанжао (КНР)" [Partnership agreement between Suzdal (Russia) and Shangrao (China)] (PDF). Official website of Suzdal (in Russian). September 10, 2012. Администрация Владимирской области. Постановление №433 от 13 июня 2007 г. «О реестре административно-территориальных образований и единиц Владимирской области», в ред. Постановления №169 от 5 марта 2015 г. «О внесении изменения в Постановление Губернатора области от 13.06.2007 №433 "О реестре административно-территориальных образований и единиц Владимирской области"». Вступил в силу со дня официального опубликования. Опубликован: "Владимирские ведомости", №114, 20 июня 2007 г. (Administration of Vladimir Oblast. Resolution #433 of June 13, 2007 On the Registry of the Administrative-Territorial Formations and Units of Vladimir Oblast, as amended by the Resolution #169 of March 5, 2015 On Amending Resolution #433 of the Oblast Governor of June 13, 2007 "On the Registry of the Administrative-Territorial Formations and Units of Vladimir Oblast". Effective as of the day of the official publication.). Законодательное Собрание Владимирской области. Закон №190-ОЗ от 26 ноября 2004 г. «О наделении Суздальского района и вновь образованных муниципальных образований, входящих в его состав, соответствующим статусом муниципальных образований и установлении их границ», в ред. Закона №90-ОЗ от 5 августа 2009 г. «О внесении изменений в Закон Владимирской области "О наделении Суздальского района и вновь образованных муниципальных образований, входящих в его состав, соответствующим статусом муниципальных образований и установлении их границ"». Вступил в силу со дня официального опубликования (27 ноября 2004 г.). Опубликован: "Владимирские ведомости", №331, 27 ноября 2004 г. (Legislative Assembly of Vladimir Oblast. Law #190-OZ of November 26, 2004 On Granting Suzdalsky District and the Newly Established Municipal Formations Comprising It an Appropriate Status of the Municipal Formations and on Establishing Their Borders, as amended by the Law #90-OZ of August 5, 2009 On Amending the Law of Vladimir Oblast "On Granting Suzdalsky District and the Newly Established Municipal Formations Comprising It an Appropriate Status of the Municipal Formations and on Establishing Their Borders". Effective as of the day of the official publication (November 27, 2004).). Vladimir is a city and the administrative center of Vladimir Oblast, Russia, located on the Klyazma River, 200 kilometers (120 mi) to the east of Moscow. It is served by a railway and the M7 motorway. Its population is 345,373 (2010 Census); 315,954 (2002 Census); 349,702 (1989 Census). Vladimir has a notable significance in Russian history, as it served as the country's capital city in the 12th-13th centuries. Murom is a historical city in Vladimir Oblast, Russia, which sprawls along the left bank of the Oka River. Population: 116,075 (2010 Census); 126,901 (2002 Census); 124,229 (1989 Census). Yuryev-Polsky is an old town and the administrative center of Yuryev-Polsky District of Vladimir Oblast, Russia, located in the upper reaches of the Koloksha River, 68 kilometers (42 mi) northwest of Vladimir, the administrative center of the oblast. Population: 19,595 (2010 Census); 19,906 (2002 Census); 22,247 (1989 Census); 23,000 (1974). Sudogda is a town and the administrative center of Sudogodsky District in Vladimir Oblast, Russia, located on the left bank of the Sudogda River 40 kilometers (25 mi) southeast of Vladimir, the administrative center of the oblast. Population: 11,848 (2010 Census); 13,328 (2002 Census); 14,191 (1989 Census). Lakinsk is a town in Sobinsky District of Vladimir Oblast, Russia, located on the left bank of the Klyazma River, 32 kilometers (20 mi) southwest of Vladimir, the administrative center of the oblast. Population: 15,715 (2010 Census); 17,086 (2002 Census); 18,918 (1989 Census). Sobinka is a town and the administrative center of Sobinsky District in Vladimir Oblast, Russia, located on the right bank of the Klyazma River, 37 kilometers (23 mi) southwest of Vladimir, the administrative center of the oblast. Population: 19,482 (2010 Census); 21,054 (2002 Census); 23,720 (1989 Census). Strunino is a town in Alexandrovsky District of Vladimir Oblast, Russia, located 131 kilometers (81 mi) northwest of Vladimir, the administrative center of the oblast. Population: 14,369 (2010 Census); 16,056 (2002 Census); 18,658 (1989 Census). Petushki is a town and the administrative center of Petushinsky District in Vladimir Oblast, Russia, located on the left bank of the Klyazma River on the Moscow–Nizhny Novgorod railway and motorway, 67 kilometers (42 mi) west of Vladimir, the administrative center of the oblast. Population: 15,148 (2010 Census); 16,482 (2002 Census); 20,144 (1989 Census). Kosteryovo is a town in Petushinsky District of Vladimir Oblast, Russia, located on the Lipnya River, 52 kilometers (32 mi) west of Vladimir, the administrative center of the oblast. Population: 9,073 (2010 Census); 9,608 (2002 Census); 11,777 (1989 Census). 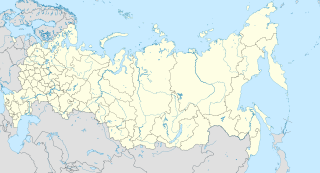 Yuryev-Polsky District is an administrative and municipal district (raion), one of the sixteen in Vladimir Oblast, Russia. It is located in the northwest of the oblast. The area of the district is 1,910 square kilometers (740 sq mi). Its administrative center is the town of Yuryev-Polsky. Population: 36,747 (2010 Census); 39,023 ; 42,219 (1989 Census). The population of the administrative center accounts for 53.3% of the district's total population. Melenki is a town and the administrative center of Melenkovsky District in Vladimir Oblast, Russia, located in the Meshchera Lowlands on the banks of the Unzha River, 150 kilometers (93 mi) southeast of Vladimir, the administrative center of the oblast. Population: 15,206 (2010 Census); 16,344 (2002 Census); 18,340 (1989 Census). Gus-Khrustalny District is an administrative and municipal district (raion), one of the sixteen in Vladimir Oblast, Russia. It is located in the south of the oblast. The area of the district is 4,370 square kilometers (1,690 sq mi). Its administrative center is the town of Gus-Khrustalny. Population: 44,883 (2010 Census); 50,813 ; 58,748 (1989 Census). Suzdalsky District is an administrative and municipal district (raion), one of the sixteen in Vladimir Oblast, Russia. It is located in the north of the oblast. The area of the district is 1,479 square kilometers (571 sq mi). Its administrative center is the town of Suzdal. Population: 44,114 (2010 Census); 39,736 ; 39,670 (1989 Census). The population of Suzdal accounts for 23.9% of the district's total population.